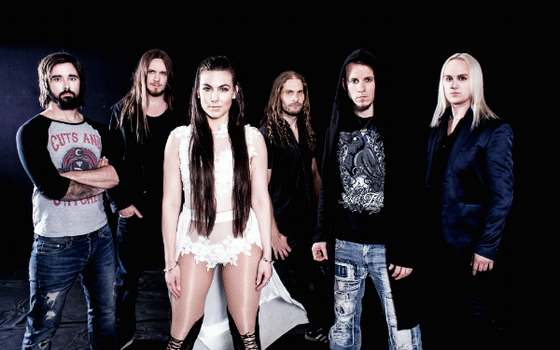 Ever moving forward and perpetually touring, Amaranthe has tried to overtake the metal world since the release of their first, self-titled album in 2011. While Europe seemed to immediately embrace the power/melodic death/pop/etc format of the band’s unique approach, it’s taken a little longer for North American fans to jump on board. But after the success of “Drop Dead Cynical” and Massive Addictive, it’s clear that both sides of the Atlantic have some clear passion for the band. 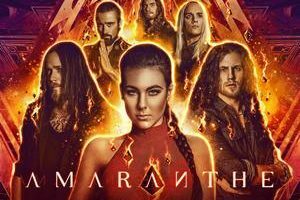 Their latest album, Maximalism, takes the already unique formula of Amaranthe and well, maximizes it. More “non-metal” influences are apparent, more diverse structuring to the vocal patterns, and a wider variety of tunes. This winter saw the first time the band has hit the US in support of Maximalism, and they’ve just finished their first round of touring (and will undoubtedly be back). But before they left, DR was able to grab vocalist Elize Ryd for a few minutes prior to one of the band’s last gigs of the tour in New York City to discuss the recent permanent departure of vocalist Jake E, the search for a replacement, her dream of being in a musical, pitching “Endlessly” to Disney, and more! Elize Ryd: It was a slow process rather than something very shocking. It’s probably what you noticed – everyone noticed…he was cancelling tours. He decided to stay home and work on other things – he wanted to focus on a movie career, and some other things he felt that he had to do. We’ve been doing this band for a very long time and I feel the same way. We are getting older – the older you get, the more you feel stressed about things like, “well I wanted to do this and that…how will I have time for everything?” The band takes up so much time. There’s things you want to achieve! He had kids so had probably 50% of the time I have, as someone who does not have kids. That’s why I haven’t had kids yet. I know there are things that I want to do still, like a musical for example. It’s just a small thing, but that would be lovely. I would love to put out a solo record, but that would also take time. I need to do those things before I have kids – because then I know I will not have time. For him, he had a child and he has only so much time [to spend with his family] so he has to be careful in how he spends it. It’s his life, it’s not our life or someone else’s life – it’s his life and this is what he decided to do. We can’t do anything else but continue. We have a big audience and the rest of us don’t want to stop because of that. Dead Rhetoric: I know that it’s fresh that he has permanently exited the band, but do you have any idea about the long-term plan in finding a replacement? Chris [Adam Hedman Sörbye] has played a big part in filling in so far. Ryd: Chris has played a big part, and we asked him if he was interested in joining. He actually said no, because he wants to focus on Smash into Pieces. That’s the thing that people don’t understand – maybe we could offer him better pay, maybe…but it’s not about money. When you are in a band, sometimes you earn and sometimes you don’t. You can’t make your decisions based on the business, you have to do it from the heart. Otherwise you burn out. You can’t do this if you don’t love what you do. So I really respect that he wanted to stick to his own band, because I would want to do the same. I want to do my thing, and I’ll do that no matter what it takes. If I was hired by someone else, I would not enjoy it as much. So all due respect to him, and we are now looking for someone who might fit. Vocally, it’s very important because it has to suit my voice. It’s hard to find good clean vocalists. It’s hard to find good clean vocalists who actually like metal [laughs]. I know a lot of guys from my background in the musical scene, and they can pull off anything. Even people who played in the Queen musical, We Will Rock You. People who can sing rock, but know that they aren’t frontmen. They can act, but it’s not real to them. It’s actually a very rare [combination] to find. Dead Rhetoric: Now you are more stressed! Ryd: Yeah – who is going to be my partner? I want to be able to share this career with someone really nice. You never know with people – are they going to change personality-wise, after a year? Things like that make you a little bit nervous. I know musicians can always make their show, but for me, I’m singing together with someone – it’s very intimate position. I’m probably going to be the most picky one about this situation. Ryd: Maybe some other people in the band may think, his voice…or hers? Are we going to have a female? [Laughs] That would be cool. Actually I wanted Alissa [White-Gluz] to join the band. I was drop dead serious about that. But then she got the Arch Enemy gig. She’s very happy with her life and career, as it is now. She doesn’t need to share her voice with two other people, like I have to and Henrik [Englund Wilhemsson] has to. Anyways…it’s going to be very interesting to see if we can find a match. You can go through YouTube…you can search every corner. I know Thomas Youngblood [Kamelot] is very good at that, and Nightwish is very good at finding new replacements. It’s so weird that we are in that position now. I didn’t really expect it – but on the other hand, maybe I’m just blind? Maybe I just didn’t see…people are growing up, they are having kids, and they are choosing other things. It’s not only the band [for them]. For me, it’s been the focus, with some side projects of course. It’s very weird how age changes your view on things. If you want to survive in this business…that’s one of the reasons people stay young. If you grow up then you just don’t feel like you fit in any more. I have been thinking about this – why is everyone always so young? It seems like musicians don’t grow up. At least they don’t allow themselves to get old, which I think is a good thing. I always thought it was nice to allow yourself to live your life and stay young forever [through music]. A lot of fans who are older say they feel like they are 25, because the music…metal, makes them feel young. Dead Rhetoric: That’s my view [laughs]. Ryd: I honestly agree. It’s a very amazing feeling. Dead Rhetoric: You mentioned your interest in a musical – what would you want to do if you were given the chance to be in a musical? What’s your goal? Ryd: I had the education for it, so I did a lot of musicals [growing up]. One good thing is that there are no age limits. I can play Maleficent or I could play in Les Miserables – the mom who dies [laughs], I could be her! I’m just kidding…seriously, I love to play theater, and that’s one thing I’m not able to do here. I also wanted to go to Broadway. But we have played shows with the band at Broadway, so I kind of feel like I fulfilled that dream. So I could do a musical anywhere, and usually there are musicals that only play for half a year. But if it’s a successful set up, they can go longer. It’s not a lifetime role if you don’t want it to be. You have to audition all the time. I just want to do one. It’s on my bucket list. I want to be in a musical. If I could find time for that, it would be so cool. If I couldn’t do dance anymore, like I used to, at least I could do the theater and vocals. My favorites are Les Miserables and Miss Saigon – those dramatic musicals, I love those. And also a few rock musicals, which would probably suit me better. Or something like, [begins to sing Phantom of the Opera]. With The Phantom of the Opera, I would get the chance to sing more classically. Dead Rhetoric: It seems like “Endlessly” has a vibe that could fit that. Or have you pitched it to Disney to squeeze it into an upcoming release? Ryd: That would be so cool – I don’t even know if it’s possible now since the song has already been released. Ryd: They do! Jesus Christ – please put “Endlessly” into a cool movie! Dead Rhetoric: We’ll start one of those petitions for it online. Ryd: Now that we’ve started to talk about it [someone can get the ball rolling]. It’s funny that you mention that, I’ve heard a few others say that as well. Which also makes me think, that if I had time, it would be fun to write music for a Disney movie, or some sort of animated film. Or even write a musical – about metal people and being on the road [laughs]. The Roadie – it could be called The Roadie. When we write songs, we usually can picture them in some sort of action movie. Or we see a movie and we get inspired by it – if we were to transform that movie into a song, how would it sound? It’s very inspiring: the idea of images versus sound. Dead Rhetoric: Last time we talked, before Maximalism was released, we had discussed “That Song” and the fan reaction to it. Now that you are playing it live, do you feel that it fits right into the setlist? Ryd: Yes! I said it yesterday, I probably said it last week, and 2-3 weeks before that…”That Song” is, except for “Amaranthine” because I love to hear the audience sing, one of my favorite songs to play live. It’s so fun – I think it sounds so much better live. There is more power behind it. In studio, when people are listening on their iPhones or whatever – you don’t feel the [drum beat]. It’s like a little story. In the [encore] set, we start off with “Digital World,” which is very futuristic and then it takes us back to “That Song.” I play myself when I was 15 years old when I sing “That Song.” It’s so true that the metal sound is what brings us home, in our hearts. Even if we sold our souls to rock and roll [laughs]. It’s very cliché, but we are on the road all the time so it’s kind of true. It’s very fun to actually think back to how it used to be, and not to get stuck in the life you are living now. It’s easy to get stuck and assume – start taking things for granted. That song really takes us back, and pulls us down to Earth. It reminds us, in every perspective: how different we are as a band and what has happened to us, how much we have achieved lately, how brave we are for doing what we do, and how much we love our fans. The fans who actually buy a ticket and come to our shows, who are some of our real fans, have accepted “That Song” already. You can see how they start to groove – it’s a different tempo, and it stands out from every other song we play live. It’s an amazing feeling. I’m glad we did that [song]. That’s one of the funny things about being alive – to challenge the things around you and yourself. Do things differently than just following what other people do. At least that’s what I think. Dare to be different, dare to stand out!